Tee hee hee. Excited to hear their conversations. Posting up near by (and attempting to ruin) someone's romantic dinner with my stray dog friend while Lilly attends a meeting. Lilly finds a pack of kids to cling to. Just seltzer for this gurl! Daddy taking good care of our baby! 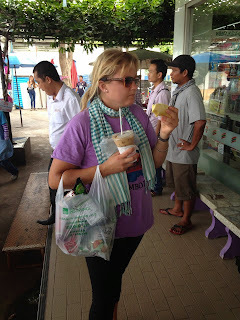 After being in Thailand for 5 minutes Lilly has accumulated a bag of crap, an ice coffee, and street fruit. 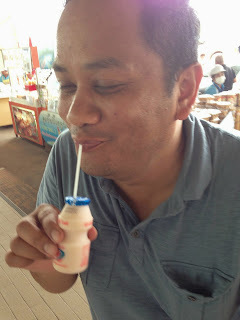 Also, Berto tries a local drink. Skipped the BBQ rats and tried the snake. Dinner: coconut beef curry with jasmine rice.